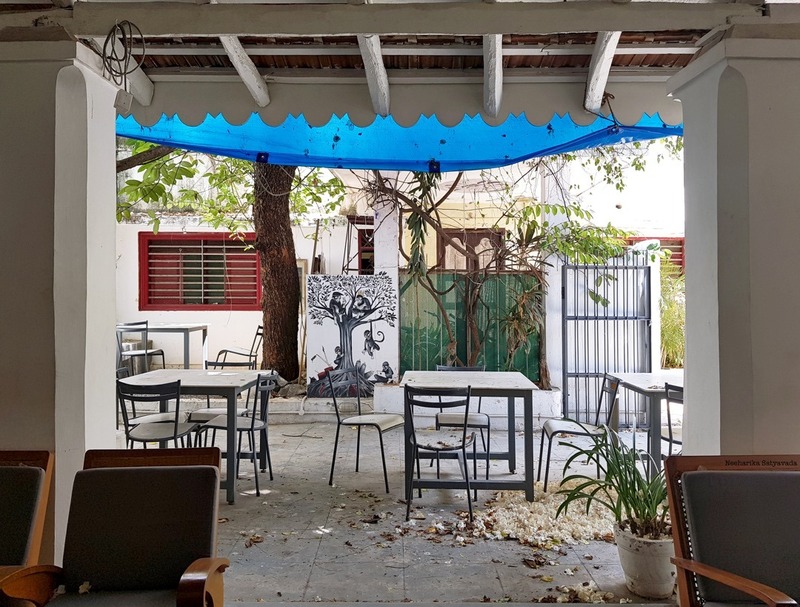 A hidden courtyard, swirling bougainvilleas dancing down in the breeze to carpet the floor, walls and doors adorned with graffiti that ranges from cute to edgy; the Artika Cafe Gallery in White Town, Pondicherry truly is a hidden gem. Sequestered away behind a row of ordinary looking shops, this quiet and low key cafe is more of a local favourite than a tourist hotspot and probably the best French Cafe in Pondicherry. A couple of locals that we had met on our last trip to Pondicherry recommended Artika to us, after hearing of our experiences with the more popular “tourist favourites”. But as it is with cafes in Pondicherry (they are very particular about their timings and don’t usually stay open late or long! ), I didn’t get a chance to go to Artika then. So, here I am now. Artika Cafe Gallery, White Town, Pondicherry. Courtyard Cafes have my heart anyway. But this one is a winner because it is artsy without trying too hard. Plus I really liked the abandoned and overrun kind of entrance into the cafe. Like you have stumbled upon something, though beautiful, is easy to miss. I also loved the feel of the place. Relaxed. The crowd that it draws, seek it, for that too. It surely helps that Artika Cafe Gallery is more an offbeat favourite rather than a mainstream one! They have limited menus on certain days. On the day we were there they were out of both pesto and fries! So, I had croissants and cold coffee. But from whatever little we tried, the food was freshly made and tasted good. So, all in all the decent coffee and buttery croissants – though nothing exceptional – were good enough for me to want to go back. Not overtly friendly or over the top warm but welcoming enough for you to make yourself comfortable here at the cafe and even stay awhile. Ideal for those days when you just want to sit down, take it easy, maybe catch up with old friends. Mid Range cafe, you can get a main dish for less than Rs.300/-. So if it is just coffee and nibbles for two, except it to be around Rs.500/-. Definitely worth the experience. Timings: 8:30 AM – 6:30 PM, Closed on Wednesdays. Getting There: Just three lanes away from the promenade into the heart of White Town, it is easily accessible from the beach. 😄 True. A book and coffee for me!